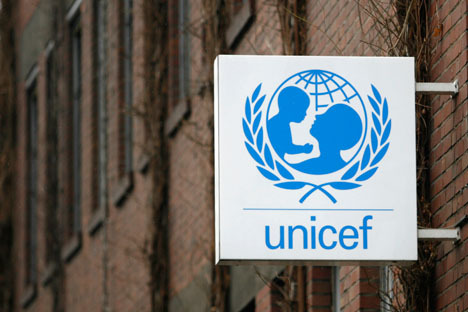 The United Nations Children's Fund (UNICEF) is to phase down its activities in Russia by January 2013. As in the case with the U.S. Agency for International Development (USAID), the Russian Foreign Ministry attributes the need to halt UNICEF operations in Russia to the fact that Russia has turned into a donor state rather than a recipient of aid. UNICEF reports to have completed all of its programs in Russia last year. On Oct. 9, the Russian Foreign Ministry announced that UNICEF will have to complete all of its remaining projects in Russia by December 31, 2012. “UNICEF operations were phased down in December 2011, following our notice sent to the Fund back in 2009. There is nothing extraordinary here,” a spokesperson for the Foreign Ministry told RIA Novosti. Indeed, The Kremlin has stepped up its foreign aid contributions fivefold over the past six years, up to $470 million in 2010. It has also offered funds to help Europe climb out of its financial troubles and extended billions of dollars in loans to neighboring Belarus. Yet, same reasons given for UNICEF’s exit were also given in mid-September, when the Foreign Ministry announced an end to USAID operations in Russia. “Russia is one of the ‘new donors’ now and refuses to accept the status of a recipient of development aid from any international organization,” Foreign Ministry spokesman Alexander Lukashevich said. However, unlike the Fund, USAID was additionally accused of operating outside the framework of “bilateral humanitarian cooperation” – a claim that indirectly refers to American support for Russian human rights organizations, including the election monitoring association Golos. The termination of UNICEF operations in Russia was also not as unexpected as USAID’s exit. On September 4, 2009, former President Dmitry Medvedev issued a ruling for UNICEF to close its operating program offices and funds. Following his instructions, UNICEF closed its representative office in Moscow and the office in Vladikavkaz. The closed representative office was planned to assist the Russian authorities in creating the Russian national UNICEF Committee throughout 2012-2013. “It is premature to speak of this,” spokespeople for the Fund told Gazeta.Ru. The Russian UNICEF office has, however, announced that the organization will still be seeking new forms of cooperation with Russian authorities in the future. The format of the Fund’s work in Russia has changed many times over its 21 years of operation in the country. “The most recent transformations have been aimed at supporting Russia’s growing role in international development efforts,” a spokesperson for UNICEF said. The original UNICEF relations office was transformed into a full-fledged representative office that worked on cooperative programs with the Russian government. In January 2012, a partnership office was established in Moscow and managed by the UNICEF Regional Office for Central and Eastern Europe and the Commonwealth of Independent States (CEE/CIS), which is headquartered in Geneva. The Fund insists that all UNICEF programs managed by the representative office were completed by the end of 2011, along with the work of the office itself. The original plans to phase down UNICEF programs had, however, been altered. Following a request by Steven Allen, the regional director for Central and Eastern Europe and the CIS, the Foreign Ministry allowed the Fund to continue its operations for an additional 12 months, in order to disburse around $1 million in accumulated donations and deal with other economic matters. Since then, the Fund has been in talks with the Russian authorities over the future format of engagement, UNICEF spokesman John Budd told RIA Novosti. “We are aware of the statements made by the Russian Foreign Ministry, but we are still discussing new partnership options after completion of our programs in the country and closure of the regional office in 2011,” Budd said. During the final five years of its operations in Russia, UNICEF injected $45.8 million in programs to combat HIV/AIDS among the youth, promote early childhood development, protect children’s rights and draw up state policies regarding children. In a separate effort, the Fund also addressed children’s rights in the North Caucasus – especially those of refugee children. “I think it's a shame and a major political mistake,” said Alexei Golovan, a former children's ombudsman and current member of the presidential human rights council. Golovan highlighted the fact that UNICEF provided valuable research and information, concerning both best practices and guidance for improving policy on childhood poverty and the treatment of orphans and children with disabilities. The Fund will continue to implement five programs until its ceases its activities in Russia: the inclusive kindergarten in Nizhny Novgorod, a boarding school for blind and deaf children in Sergiev Posad, a rehabilitation center for orphans in St. Petersburg, a center for children from troubled homes in St. Petersburg and an early intervention center for children, also based in St. Petersburg. Astakhov gave all indication that Russia will continue to give funding to UNICEF for programs in other countries. UNICEF currently operates in 157 countries across the globe and has extensive programs in huge emerging markets such as China, Brazil and India. It also conducts educational campaigns and political lobbying in developed countries like Britain. The article is based on the reports from Gazeta.ru (Lev Makedonov) and The Moscow Times (Jonathan Earle and Howard Amos).